We love almost everything about the Grandio Elite Greenhouses. The Grandio Elite models feature high-quality metal frames, thick 10mm dual-layer polycarbonate, tall (8'2") barn-style roofs, and sliding double doors that are bind resistant. They also have built-in rain gutters on both sides of the greenhouse, they come with roof vents that have adjustable openers and latches, they are fitted with extra roof and side supports to increase wind and snow load strength, and they are powder coated to both enhance the finish of the metal frame (powder coating is much tougher than standard paint) and to give a pleasing, dark green color that fits nicely into your yard decor. And they are available in sizes from 8'x8' through 8'x24'. Grandio Elites are made with powder-coated, aluminum framed pieces that fit together with stainless steel nuts and bolts. The actual frame pieces of the Grandios are impressively thick and rugged. We've looked at a number of aluminum greenhouses and there are vast differences in the thickness and strength of the frames that we've seen. On the lower end you'll find frames that are thin and bendable and are not designed to withstand much wind or snow load and will likely not last long if the greenhouse is left outside all year round. The Grandio frame pieces are definitely on the higher end of the strength spectrum and parts of them look like mini versions of steel girders. We actually took a couple different frame pieces from the Grandio, hung them across exposed roof rafters and we could do chin-ups without them bending (okay, not many chin-ups, but that's a problem with arm strength.) We took the thckest pieces from another aluminum greenhouse (we won't name the brand, but it's one that is sold in local hardware outlet stores) and tried the chin-up test and the pieces bent right in half. While we don't necessarily recommend using your greenhouse parts for exercising, what this means for you is that the Grandios will stand up to higher wind levels and higher snow loads without bending or collapsing than many other hobby greenhouses. Let's also talk a bit about the powder-coating on the frame. As mentioned earlier, powder coating is a process where metal is coated with a hard finish through an electrostatic process. What this means for the Grandio frame is that instead of having a raw, exposed aluminum frame you will have a frame with a tough and durable green coating that serves to protect the underlying metal from the elements and help keep it from discoloring, rusting, or oxidizing. Many of the "silver" colored greenhouses have no coating at all and are just raw aluminum. Some others have colored frames, but may just be painted and not actually powder-coated. That might be slightly better than just raw aluminum, but paint can easily be scratched and can flake off (you can test how soft paint on aluminum is by scratching it with your thumbnail.) The better greenhouses out there will come with powder-coating so we suggest looking for that when shopping around. Another great feature of the Grandio frames is the extra supports and cross beams that have been added to the greenhouses. The cross beam pieces are set diagonally in the frame to help firm up and strengthen and minimize any side to side movement. The extra support pieces are attached from the upper walls and reach up and attach to the lower roof. These help provide roof support and add strength to the roof sections. We've had a 16' greenhouse in the past that didn't have any kind of supports like these and after a couple of years the roof was sagging in the middle noticeably. All these frame features add up to a very strong, rigid, and durable frame that we put in the same category as some of the better competing models such as Riga greenhouses and the Juliana Premium greenhouses, that are also very good but may be quite a lot more money than the Grandios. The installation of our Grandio Greenhouse was surprisingly easy. While any project like this is daunting when you first open the boxes and see all the parts (I'm looking at you Wal-mart loft bed with attached dresser and desk), but the instructions were very well diagrammed which made it very easy to determine the process and order of fitting parts together, mounting the panels, inserting the roof vents, etc. We've set up a few other greenhouses that were miserable to put together and had instructions that appeared to have been written by someone who either had never seen a greenhouse, did not speak English, or more likely both. If you've ever had to put together an item from overseas with the confusing and poorly translated instructions then you will understand what we went through. In comparison, the Grandio instructions seemed well thought out and were not difficult to follow, especially once we worked out a system where we inventoried all of the parts and separated them first. That way we were able to get an assembly line kind of thing going and go down the line bolting parts into place for the various sections of the greenhouse. Probably the best tip we can give to help with the installation is to check, double check, measure again, and then check one last time that the base gets set absolutely square and level. This will make everything else then go very smoothly and easily, and the parts will line up and fit properly. This is true of any greenhouse and by the time we set up the Grandio we had made this mistake before on other greenhouses and were sure to square it up correctly so we didn't have to waste time disassembling and re-assembling because we were setting it up skewed. 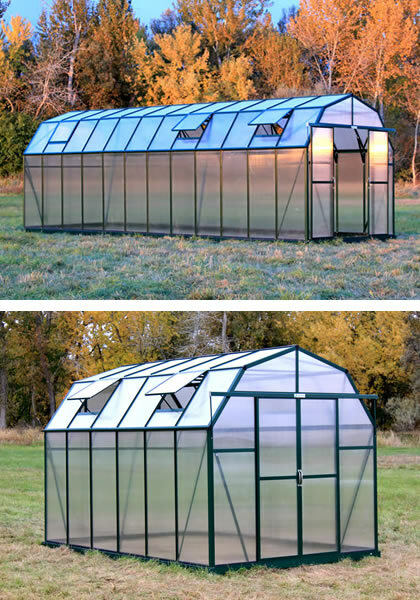 Currently the Grandio Greenhouses come in two different models with a five different size options for each. The Grandio Ascent is 7 feet 9 inches tall by 8 feet wide, comes in lengths of either 8 feet, 12 feet, 16 feet, 20 feet, and 24 feet, and features an A-frame style roof. This style of roof is great for those gardeners who are concerned about snow build-up, because generally the snow will slide off easily with the straight slope. It also is a great classic look for a greenhouse. The Grandio Elite is 8 feet tall by 8 feet 2 inches wide and comes in lengths of 8 feet, 12 feet, 16 feet, 20 feet, and 24 feet. The Elite has a barn-shaped roof with is a really nice option if you want the maximum amount of headroom. For taller gardeners or those who will be spending a fair amount of time in the greenhouse this will mean much less bending over and gives more room to move around. Snow load still shouldn't be much of a concern because the only the very top sections of the roof are horizontal enough to gather much snow, and those can easily be brushed off with a broom if necessary. The greenhouse door is something that many of us don't really think about until it comes time to try to move your wheelbarrow inside with a load of compost and you realize that there is no way it will fit. But with the Elite there is about 4' of door width which is plenty of room to get that wheelbarrow through. They have dual-front doors that slide out which makes for enough room to get into the greenhouse easily, even with equipment or tools. The sliding doors are also nice because even when open they are secure in place. That means the doors won't get flung open or closed due to a breeze (possibly damaging them), which can happen in models with swinging style doors when you've forgotten to close and latch them on some other greenhouses. Grandio Elites come with a greenhouse base kit included. This is nice because the greenhouse mounts right into the base, and the base can be set up to either go right into the ground, or it can be bolted into concrete, wood, pavers, or another material. The base itself is made of steel and is strong and sturdy. We found that what has worked best for us is to use the provided base kit and rest it in the soil a few inches below level and then use quick setting concrete at the four corners. This gives it plenty of support and keeps the greenhouse firmly planted in even the worst stormy conditions. Then we filled the inside of the greenhouse with a few inches of gravel, which can be raked aside if you are planting into the soil, and it helps quite a bit with drainage and also helps keep mud off of our garden clogs. The type of panel you select when choosing a greenhouse is extremely important. The single biggest factor in how well the greenhouse manages internal temperatures is the panel type and thickness. The panels on the sides and roof of the Grandio Elite are an incredibly thick 10mm twin-wall UV protected polycarbonate manufactured in Germany. If you are unfamiliar with dual-polycarbonate (sometimes also called twin-wall polycarbonate) it can be helpful to think of it as something like a piece of cardboard except with plastic instead of paper. The thicker you go on dual-poly the better at insulating in cold and hot temperatures, and the less money you will spend heating and cooling the greenhouse. In comparison, many of the hobby greenhouses being sold come standard with only 4mm panels and maybe 6mm panels on some of the better ones, and sometimes the sides and roofs will have different thicknesses on the same greenhouse. Not so with the Elites, they have fully insulated 10mm dual layer panels on all sides, back, and roof. Many of the clear paneled greenhouses are only 1mm thick single layer polycarbonate. That style can look nice, but if you are in an area that has wide temperature swings it will be much more difficult to control the heating and cooling in the greenhouse. 10mm thick panels, like on the Elite, is very insulating and you will be hard pressed to find anything comparable to those panels. All greenhouses will require some source of heat if you are planning on wintering plants in them, even with 6 to 10 mm panels, but with the Grandios a small electric or oil space heater or two, depending on how large of a greenhouse you choose, is all you should need. The Elite greenhouses come standard with the essentials needed to be immediately ready for use. All models come with a base kit, roof vents, rain gutters, easy latch double-doors, snow load supports, cross bracing supports, stainless steel nuts and bolts, instructions, etc. There are also a number of optional add-ons such as automatic roof vent openers, trellis kits, drip and irrigation kits, plant hangers, staging benchs and work tables, louver windows, solar lights, and more. The Grandio greenhouses come with a 10 warranty on the panels and a lifetime warranty on the frame. Obviously Grandio believes in their product and would only give it that kind of warranty if they knew that they were high quality units. We feel confident in recommending both the Ascent and especially the Elite greenhouses from Grandio. They are high-quality units with sturdy frames, thick panels, good instructions, nice accessories, attractive looks, and a long warranty. If you search around and compare these units (which we always think is a good idea) to others you will find that for the money you will not be able to find better greenhouses. *Information in this review is accurate as of the time of evaluation. Actual accessories and additions may or may not be available at participating retailers.